Where to begin? Quick lowdown on Jamie's Phuket Blog... 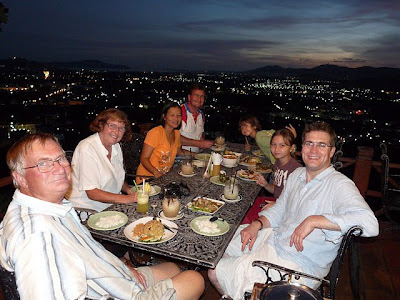 I started the blog in 2006 with the aim of showing what I might call the "real" Phuket. I have been here since 1999 and tend to keep away from the most touristy areas of Phuket, which is hard to do since I work at Karon Beach (manager for Sunrise Divers) 6 days a week... finding time to blog can be a struggle sometimes too. After over 4 years I keep finding new things to blog about - festivals, restaurants, places to visit. Some events like the vegetarian festival I blog every year, trying to get better photos than the previous year. I look at some of the old posts from 2006 - 2007 and probably should get some new pictures here and there since back then I had a cr*ppy little camera.. but until I win the lottery and can devote more time to blogging, this blog will normally get updated about once per week, hopefully with something new, hopefully something that will interest visitors. In January, I took the kids to the Phuket Tin Mining Museum, which was not quite finished and indeed closed again later in the year.. not quite sure if its 100% open now. Anyway, we loved it. I enjoyed the fact that my kids enjoyed it, if you know what I mean. I will take a look at the museum again soon and see if it's fully operational yet. 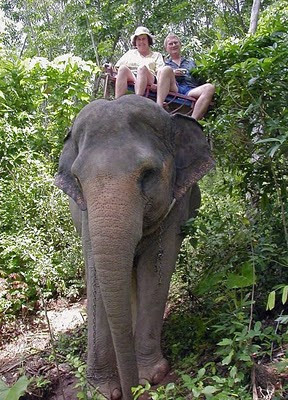 Also in January, my Mother finally sent me a very nice story which I had been asking for... she and my Dad did an elephant ride some years back and I wanted a first hand story about the experience - have a read: Elephant Ride in Phuket (by Jamie's Mum). February... The Big Buddha in Phuket is now a major attraction, and you can drive up to the top of the 400+m high hill... or you can hike up, which is what I did one morning : Hike to the Big Buddha. 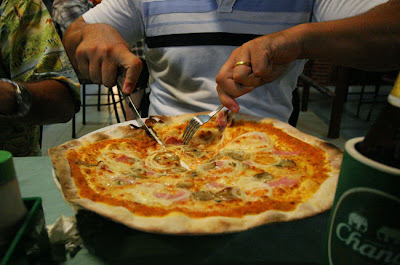 I was also happy to finally blog the Thai Italy restaurant in Patong which we have been to many times. Great Pizza. March - lots of good stuff. My wife and I enjoyed an evening at Glastnost Cafe in old Phuket Town, I had a birthday on the water chasing speedboats with a helicopter, and we discovered the Phuket Heroines Festival, something which is in the diary again for 2011. 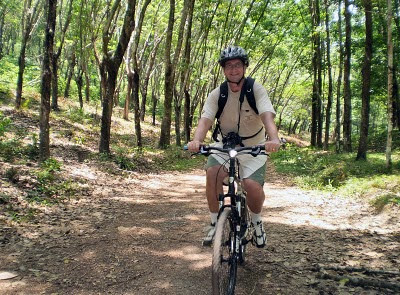 April - as if that hike in February had not been enough, I did a day trip cycling at Koh Yao Noi. Saddle sore and very enjoyable. Also blogged about a trip to James Bond Island and Ko Panyi. May - some holidays! We spent a night at the Cliff and River Jungle Resort near Khao Sok National Park. Beautiful.. we went again in September. I also re-blogged Laem Hin Seafood, which was the first restaurant on this blog and is still a favourite. 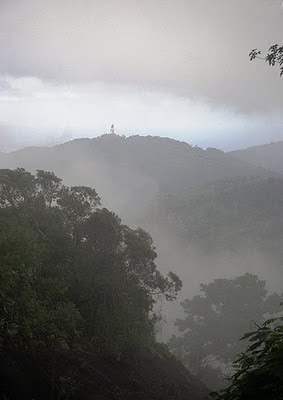 June & July ... into low season now, we drove up Radar Hill one misty morning - this is the highest road in Phuket, over 500m above sea level, with some great views. Kathu village where I live staged it's second cultural festival. In 2009 I was the only foreigner present for the main parade. In 2010, the promotion was a little better, I must have seen at least 4 other foreigners! And another very local event.. I checked out the Phuket Butterfly Release in July and there was still time for the second Phuket Photo Walk, part of the Worldwide Photo Walk. August - I finally went to see Phuket FC - I love football, and I am happy to say the Phuket FC have now been promoted to Thai Division 1. Well done, boys. Also in August I felt quite out of place for a while attending an afternoon party at the Hongyok family house in Phuket Town celebrating the 2010 Baba Wedding ceremony. Like being immersed in history. September - my wife and I used to drink coffee at Tunk Ka Cafe about 10 years ago. One day after lunch in Phuket Town we realised that we'd not been there for a loooong time. Coffee still good, and we went back again later in the month with my family visiting from England. Dinner with a view. October - I had found out about Phuket Heritage Trails via a friend on Facebook - Pu and Gan will give people a real Phuket cultural tour, as you'd expect from 2 Phuket natives. I went with Mum, Dad and an errant traveling cousin on a morning tour around old Phuket. Great. I posted multiple entries about the festival : Part 1, Episode 2 and the much awaited Chapter 3. Plus there are lots of photos on Flickr: Phuket Vegetarian Festival 2010. I might change camera next year, but the old Canon EOS 20D was aided by the purchase of a 50mm f1.8 lens which was used for the photo above. Very good for sharp portraits. December, nearly home. We had already done a trip in Phang Nga Bay this year, but I reckoned if we planned things right we could hit James Bond Island when all the tourists had gone home. It's taken a few trips to plan this. But now we've got it sorted - Phang Nga Bay - Doing it Our Way :) - and you can book a tour doing it Jamie-Style by contacting Easy Day Thailand, a tour company set up by some friends of mine this year. The Big Buddha has been blogged many times as the building continued for many years, and is still not complete. We were up there again in December to get the latest photos. I also blogged about local markets - want to see real local life? Markets are the place to be. December was time for something new in Phuket. 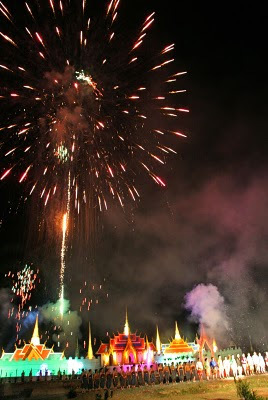 The first 'Phuket Street Show' festival. A couple of streets in old Phuket Town were closed off for several evenings and made into walking streets with stalls and stages set up with performers doing juggling, drumming, acrobatics, comedy and more. Great event, happy faces everywhere. In fact my favourite photo of the festival is a photo of the crowd. Everyone is smiling. I have been in Phuket for 11 years now, still looking for new places, new food, new experiences. Maybe in 2011 I will finally try the bungy jump. We have been to Phuket Fantasea recently, not blogged yet. I want to take the family out on boat trips to the Similan Islands and Phi Phi sometime soon. And people have contacted asking for some more general information on the blog... Maybe. I want to keep this blog a bit more personal showing this places we go as a family. If anyone has any suggestions for what could be on the blog, do let me know. Oh, and please do Follow me on Twitter and join the Jamie's Phuket Facebook Page. Happy New Year! Sawasdee Pee Mai!